In microelectronics production environments, bond testing can provide a means of evaluating bond quality and verifying bond consistency and reliability—better known as wire bond or ball shear testing. Bond shear testing augments a wire pull test by assessing the strength of an individual ball bond. By applying force to the ball bond in the lateral direction (parallel to the substrate), a bond shear test enables analysis of the strength between the bond pad and a ball bond. Bond shear test tool height with respect to the substrate should remain consistent between test runs. For the bests results a shear tool should be selected with a width larger than the diameter of the ball bond or longest die side. Other bond tests include tweezer or ball pull, stud pull, and three-point bend die strength. A bond shear test is not limited to only wire/ball bond quality assessment as it can be used to test eutectic and epoxy die bonds strengths as well. The force at which a bond breaks is the main data collected on wire bond pull and ball shear test equipment. Other data aspect available on Royce Instruments equipment includes the strain gauge (the force the bond exerts on the tool), in which results are commonly shown on a force profile plot. The shear force reading of a ball bond may be correlated with the ball diameter for proper assessment of the ball shear strength. The shear force reading of a wedge bond must be correlated to the tensile strength of the wire for proper evaluation of its wedge shear strength. As the bond yields, the measured force will reach a peak. Bond test systems capture and record this peak force as the break force. Using this recorded data, a manufacturing organization can define a baseline force for a “good” bond as a reference for all future bonds. What Information Can a Bond Test Provide? Q: Wire bonding procedure can be done as ball- or wedge-bonding and with wires from Au, Al, Cu and with different diameters. Can Royce Instruments equipment test all these bond types? A: Yes. 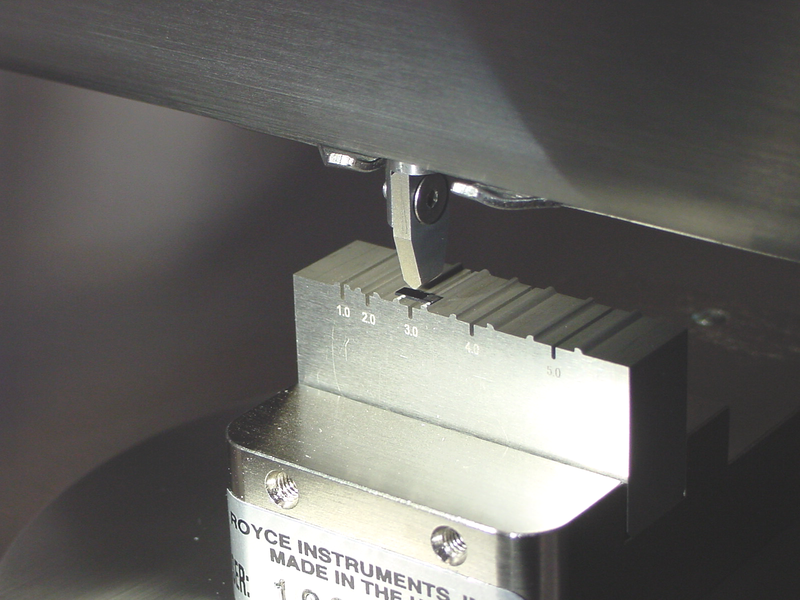 Au, Al, and Cu wire bonds of all wire diameters can be tested on the Royce Instruments, Inc. System 650. A variety of hooks and shear tools of different sizes are available to suit varying wire diameters. Q: Can Royce Instruments equipment perform non-destructive tests/evaluations of bonding strengths? A: Yes, non-destruct testing is built into Royce's Bond Test Manager software on the System 650. The test mode can be switched between destruct and non-destruct with a click of a button. In non-destruct mode, the system tests the bond up to the specified non-destruct test force limit.